Merry Christmas to you too Bacon. I hope you get everything you want today. Thanks Bacon. Merry Christmas to you and your family too! Merry Christmas Bongo, I do hope that hat wasn’t your Christmas present. I got a new harness, it is very nice but I haven’t written about it yet. Well, only to say I knew it was coming. Merry Christmas to you too Pippa. I don’t even get to keep the hat, but I did get some treats and toys – and a new bed for my dog jail. Happy Christmas to you Bongo..Now does this hat surpass the detective hat..well it certainly looks very cute and you are so patient letting your person dress you up…so yes it does! Patrecia, I’ll let my person do almost anything when she has treats in her pocket. I pose for one picture then I go for the treat. Little Binky, I’ll come over as Santa Dog and bring you some treats. I think Scratchy got too many anyway. Merry Christmas to you Bongo!!! Thanks Kevin. Merry Christmas to you and your family and the same wishes for you. Marina, that was the best wish for me yet. A fishy day would be wonderful. And Merry Christmas to you too. Merry Christmas, Bongo, with a lot of treats from Santa Paws! About your person I’m not so sure – that dog jail might count as a very-very bad point! Kolytyi, I think my person just got lumps of coal this year. Merry Christmas to you too! Thanks and Merry Christmas to you too! Cats included. 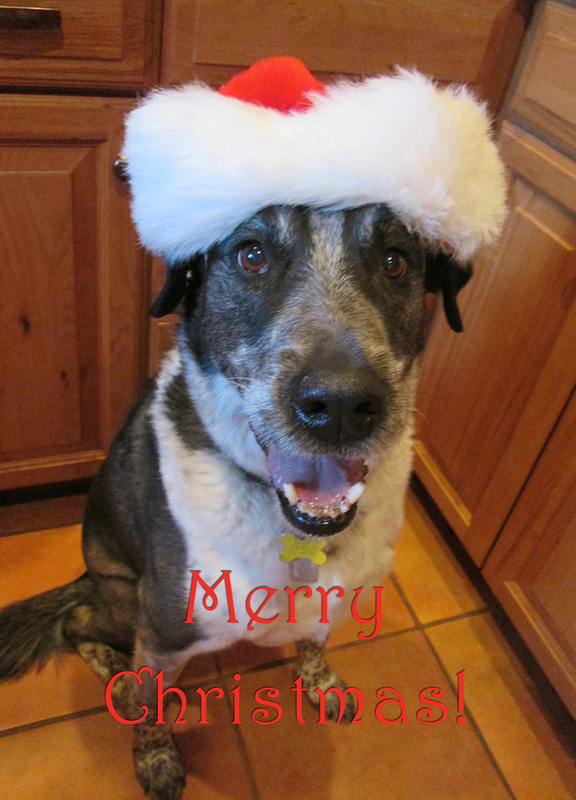 Merry Christmas Bongo…You truly are the Wonder Dog and we love you! Thanks Alex, Trish, and Penny. Merry Christmas to you too! Thanks Lexie and Mica. Merry Christmas to you and your family too. Thanks Lily. Merry Christmas to you and your family too. You look quite dashing in that Santa hat. Merry Christmas. Woo! Thanks Patricia. Merry Christmas back to you. I hope your Christmas was merry Bongo. Lets look for some exciting adventures in the new year. Lola, I’m looking forward to lots more adventures. Maybe even some before this year ends. I hope you had a really good Christmas. I may have gotten into a little trouble what with helping with the food & all. Merry Christmas Shu – even if it is a little late. I’m still on time to wish you a Happy New Year. Thanks for linking to my Christmas picture. Thanks Dalton. I hope you’re having a wonderful new year.